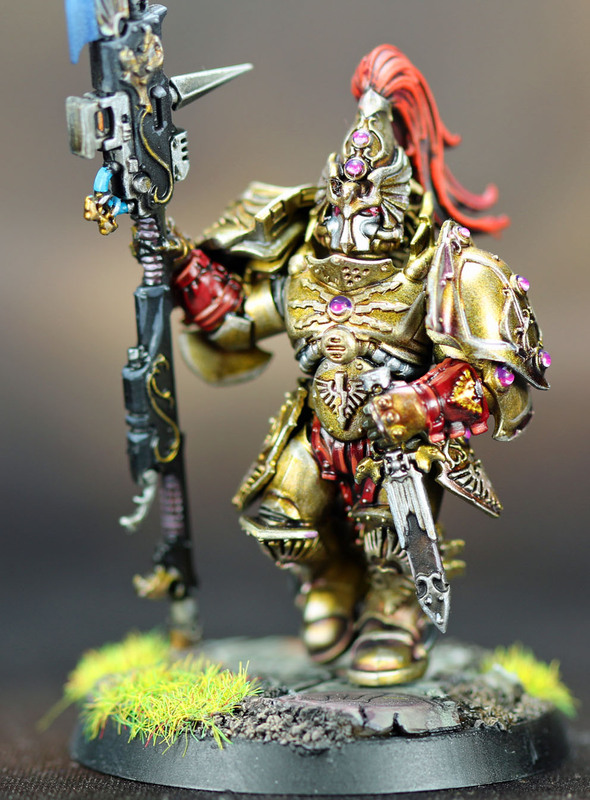 The Adeptus Custodes forms the Emperor's inner guard whose duties are to serve and protect the Master of Mankind. A continuous rota ensures that there are always several hundred of these select warriors active within the palace, as well as a small elite of guardians who never leave the Emperor's side. Their uniforms are traditional but effective, leather breeches and boots wit a long black cloak over a naked torso. Their helmets are ancient works of art; all-enclosing and tall they impart a threatening, impersonal appearance as well as providing a battery of protective equipment and communicators. 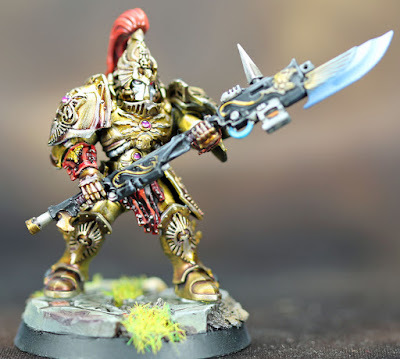 The weapons carried by these guards look very much like spears or spear-guns, but are in fact lasers built to resemble the traditional and symbolic guardian-spear which has long association with the Adeptus Custodes and which appears on their banners, badges and other regalia. The guards themselves never leave Earth, and only rarely leave the imperial palace where their duties lie - their place is by the Emperor's side. 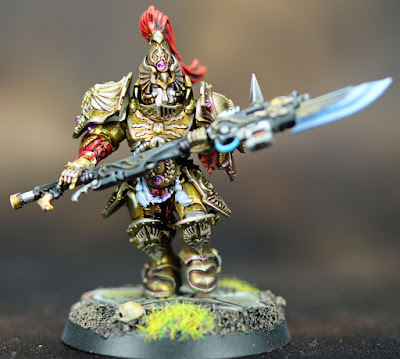 How far have the current Custodes come from their origin? 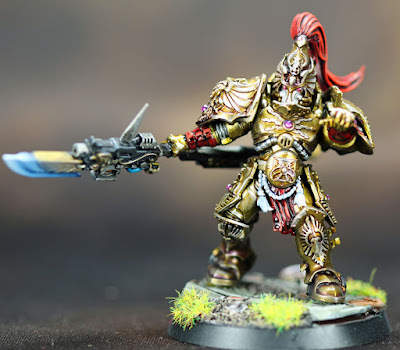 Welcome to the second in a series of posts in which I have very little recollection on how any of the models were painted! 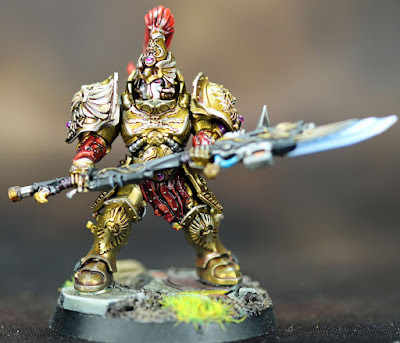 About a year or so ago, I made the mistake of going into a local game shop that I rarely visit; and there I saw an Adeptus Custodes army that had been assembled and primed gold. And at that point, I knew I wanted to paint some of them! 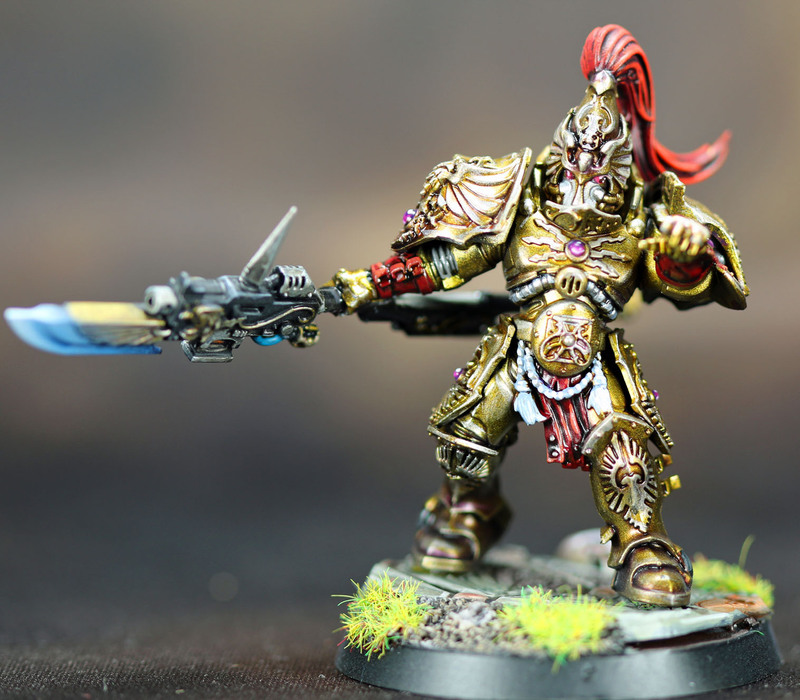 The nice thing about the Adeptus Custodes is that they can be used in both 40k and Horus Heresy. The other, more important, nice thing is that they are almost monochromatic....their armor is almost entirely gold with very little else. For the armor, I am pretty sure I used Scale 75 Decayed Metal as a base, followed by Elf Gold, Citrine Alchemy, and White Alchemy. Then I am pretty sure I applied some thinned purple and brown washes to the armor for more depth, followed by the White Alchemy again. One thing to note about the Scale 75 metallics is that I did play around with drybrushing parts of these where the texture was the most pronounced, and the Scale 75 metallic paints drybrush as smooth as any metallic paint I've ever tried drybrushing. For the red leather, I used the GW identified method...which is clearly not what they actually used as this method is way more red than theirs. They say it is Doombull brown, Nuln Oil, Wazdakka Red, and then Squig Orange. If I do another batch, I'm going to try to figure out how to brown the leather parts down. The red top-knot was also done using the GW method of Mephiston Red, Carroburg Crimson, Evil Sons Scarlet, and Wild Rider red. Although I am pretty sure I also went back with Druchi Violet painted directly into some of the recesses. These guys were a lot of fun to paint, but a nightmare to put together due to all the parts and sub-assemblies I had to use...plus lining up all the arms and wrists for the double handed spears was a pain. I think if I do another batch, they're going to have sword and shield instead! Wow, it was worth the effort, I would say! Thanks, the scale 75 metallics are about as good as they get, they make everything easier! I can empathise with you about the assembly Andrew. I just helped my son put together some space marines. They are too fiddly IMHO. I think if I left him to do it on his own he would have given up. Angmoos and Melmoos--And Wave 2 is complete!